The CryoFacial™ unit uses pressurized liquid nitrogen vapors which are applied to the face and neck to stimulate the production of collagen and decrease pore size. The skin becomes tighter, more even-toned, and blood circulation is improved. Over time, skin becomes more elastic due to the increase in collagen. Whole body cryotherapy and CryoFacial™ treatments have become the favored anti-aging "bio-hack" of celebrities worldwide. Now the same treatments are available to you at Infinity Healing Center in Braselton, GA! By focusing exclusively on the face with our CryoWand, the surface of the face is enhanced immediately as the pores will appear much smaller and all inflammation and “puffiness” in the face is eliminated. Fine lines and wrinkles begin to disappear as your body responds to the cold by producing more collagen. Your face simply looks tighter. 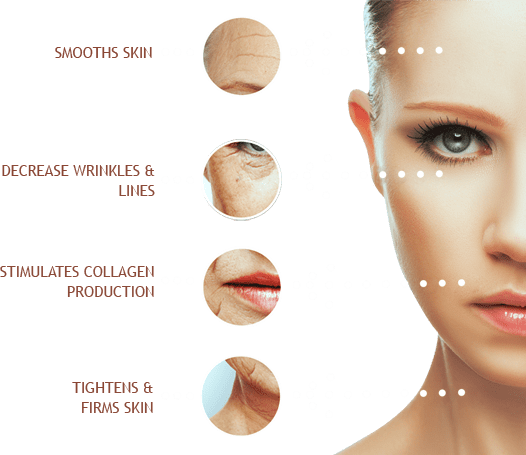 Then, with repeated applications, the collagen benefit is apparent as the skin’s actual elasticity is returned to an earlier, younger time in the life of the skin. Clients are pleasantly surprised to see the instantaneous difference, which does not require surgery, down time, or pain. Cryo-Facial™ therapy is a cryogenic treatment using a local cryotherapy machine to apply ultra-cooled Nitrogen gas to the face, scalp, and neck. The therapy also increases collagen production which strengthens the skin, hair and nails as well as eliminating & flushing away toxins. Cryo-Facial™ can also be used to treat inflammatory skin conditions including acne, psoriasis, eczema and rosacea. *Statements have not been evaluated by the FDA. This product is not intended to diagnose, treat, cure, or prevent any disease.